William Mandella is a soldier in Earth's elite brigade. As the war against the Taurans sends him from galaxy to galaxy, he learns to use protective body shells and sophisticated weapons. He adapts to the cultures and terrains of distant outposts. But with each month in space, years are passing on Earth. Where will he call home when (and if) the Forever War ends? 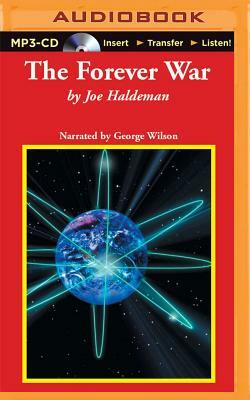 Narrator George Wilson's performance conveys all the imaginative technology and human drama of The Forever War. Set against a backdrop of vivid battle scenes, this absorbing work asks provocative questions about the very nature of war.